Events Calendar has gotten even better since it was launched on the Commons as part of release 1.8 in May, 2015. A great new Events Calendar feature for Commons site owners is now available with version 1.9. 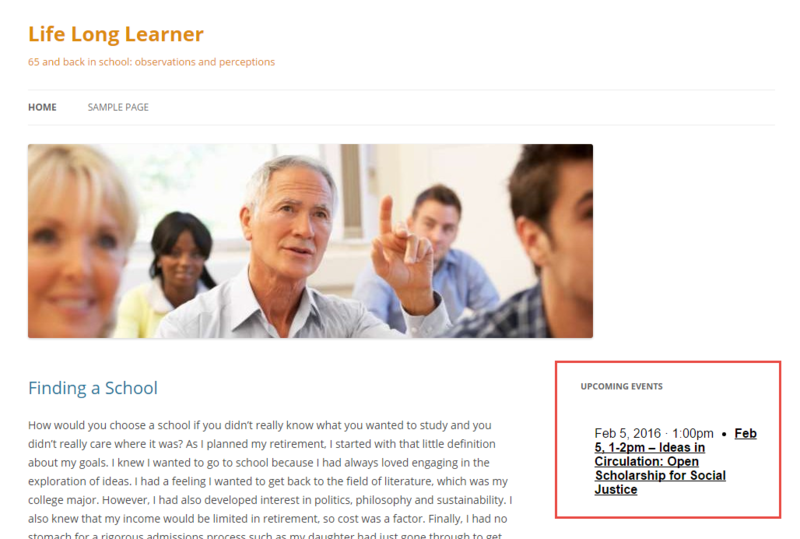 Events Calendars can now be embedded on sites on the Commons. To embed a group events calendar on your site, you add a widget to the site. Step-by-step instructions for embedding the calendar are documented in the Commons Codex. Your embedded calendar might look something like screenshot below (the exact appearance will depend on your theme and the specific location you select). Instructions are here. But wait, there’s more! While you could always download a single event, it’s now possible to download an entire calendar to your private calendar in Outlook, Apple Calendar or whatever your preferred calendar client may be. This new feature should come in handy if you are a member of a Group which conducts a series of events, such as weekly meetings or frequent conferences. Rather than tediously downloading these items one at a time, you may now download the Group Calendar in its entirety. To learn about this feature and all the other capabilities of Events Calendar go here.